Simplicity is sometimes one of the more difficult things to achieve. Whether it’s distilling masses of complex concepts into a simple analogy that anyone’s grandmother can understand, or a gourmet weeknight dinner pulled from the crowded assortment of ingredients hiding throughout a pantry. The burden is on both the one trying to explain it, and those trying to understand it. One of the objectives with this food blog was to “not” wrap these fun recipes with a diatribe of overly thought out profundity. We wanted to make it simple and fun, while ensuring to convey the inspiration of a dish, but in “less” than 200 words. Therein lays the challenge. While I hope these short musings, well – are amusing, I too hope it offers context into the how and why these particular dishes had meaning, along with a chuckle or two. Victoria has always been my muse, in both cookery and in life. But on this busy weeknight, I was simply keeping it straight forward with what was on hand, quite simply, because I skipped lunch and was famished. With the dawn of spring in the air, this modest chicken marsala popped in my head with a silky mushroom sauce and hints of lemon. But it was the delicate capellini with white pepper that added character, and the spicy zing that mirrored an eventful week. Season chicken with salt and pepper, and dredge in flour with cayenne. In a large skillet melt 1 Tbl butter with olive oil over medium heat, and cook chicken until browned on both sides, then place on baking sheet in oven at 350°F for 10 minutes. In same pan, heat olive oil on medium high heat and sauté shallots and garlic for 1 minute, then add mushrooms and 2 Tbl butter and sauté for 10 minutes, turning every few minutes. Add marsala and deglaze pan, then add stock and juice from lemon wedge. Add more stock if necessary to maintain thin consistency. Cook capellini pasta in salted boiling water until just before al dente, then drain and reserve 1/2 cup of liquid. Add capellini back to pot along with 1/2 cup of the reserve liquid, parsley parmesan, tomatoes, and toss to combine. 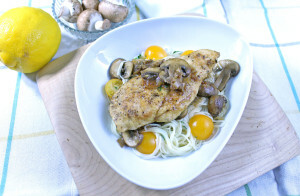 This entry was posted in Cooking, Main Dishes, Spring and tagged Pasta, Poultry by cfaust. Bookmark the permalink.